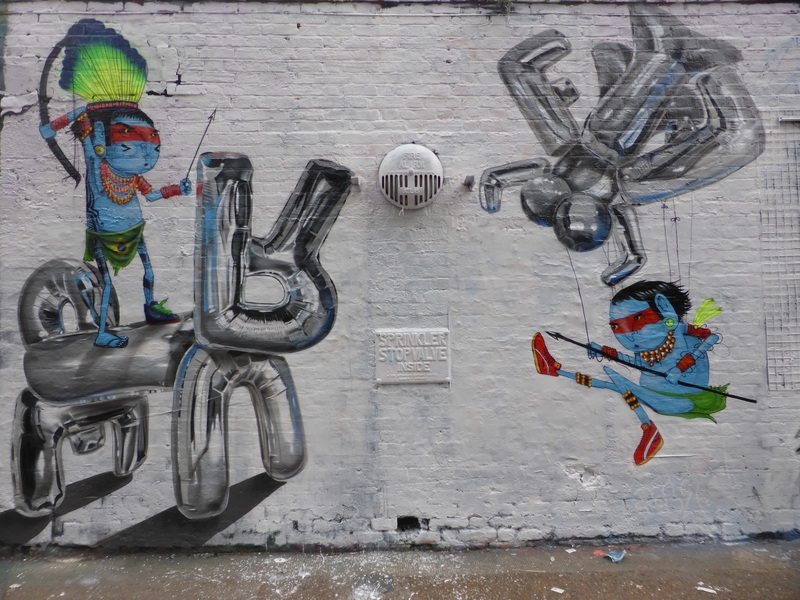 Fanakapan is one of our favourite artists on the London and even UK and global Street Art scene, someone we have admired for a very long time and it has been an absolute pleasure to witness the way in which he relentlessly strives to push the boundaries and focus of his work. So it was indeed an absolute pleasure last week when we met up with the artist on a lovely sunny evening as he finished painting his recent ‘Deflate’ work in Dalston in conjunction with his current exhibition ‘Inflation’ at the BSMT Space, where he kindly gave us the time to conduct a most insightful interview about his latest exhibition and Street Art in general. Fanakapan started painting on the streets in 2000 around Bournemouth and Bristol following his studies at art school and finding its roots in the skate culture he was immersed in at the time. Starting out with creating five layered stencil designs, it wasn’t long before Fanakapan found this an unfulfilling medium with which to express himself. From this point he also started to hone his artistic talents in a variety of mediums in a professional capacity, making props for tv shows and sculptures for such prestigious institutions as the London Aquarium (still on present for those interested). 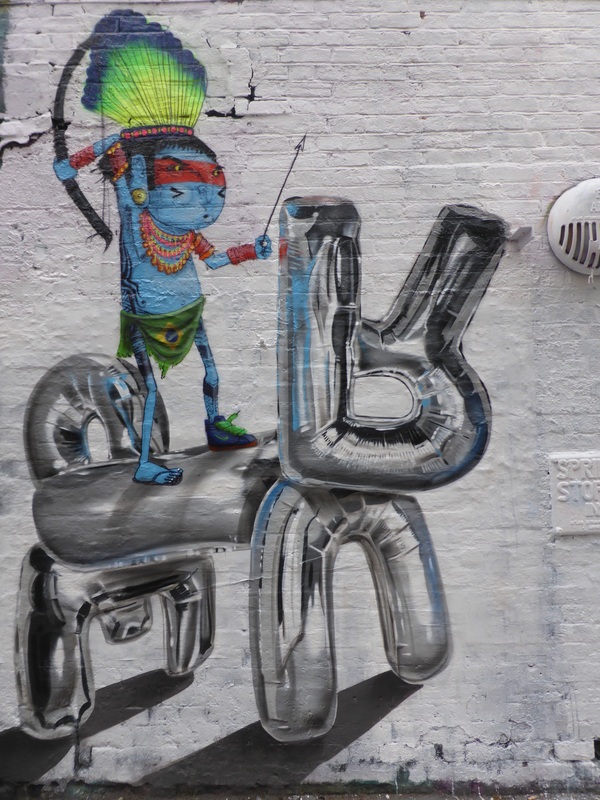 On the street Fanakapan having taken a break from stencil based works then set to start his long evolving journey with balloons in 2010 as his subjects of choice, initially focusing on more translucent rubber effect designs. This marked the natural direction for Fanakapan to become immersed in, offering much scope for the chance to develop his focus on light and shadow in order to bring his works to life. It was in fact through these works that we first became aware of and in turn fell in love with Fanakapan’s work and it really is incredible to see how he has and continues to develop his style. Not to long after this Fanakapan also developed a new subject with which he worked with for some time parallel his colourful helium balloon designs, namely his Liquorice Allsorts creations, which originally started out as a letter work and soon developed into a series of delightful characters. This focus was born from a chance occasion when the artist found himself with lots of blue and pink paint and seizing upon a suggestion from a friend that the Bassetts sweets would therefore make and appropriate subject for such a colour palette. It is interesting to note that such a direction was born from such a singular incident, as we will discuss shortly regarding his shift towards chrome effect designs. It was with his sweet based character works that Fanakapan really started to develop his technical focus upon the accompanying shadows with which to bring his designs to life. However it was back to the rubber balloon designs which in turn enabled him to expand his colour palette beyond a prevailing blue and pink. 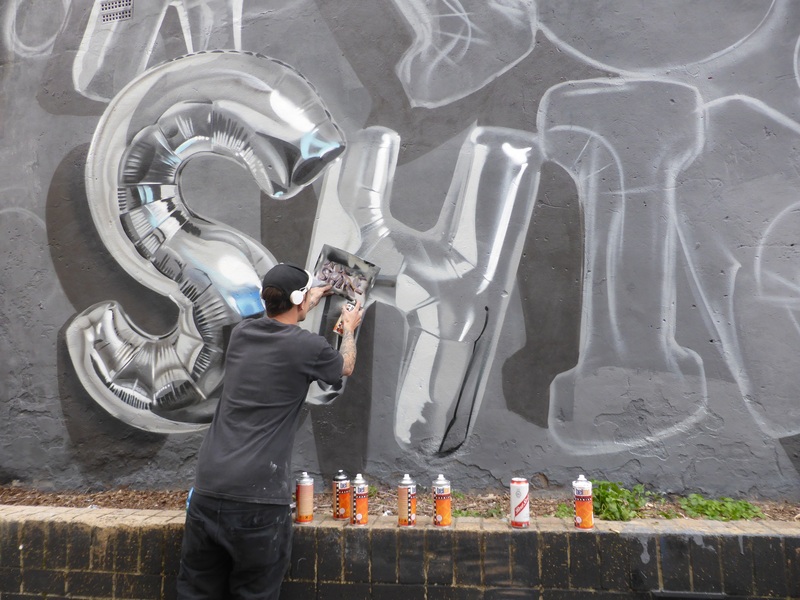 Late 2014 marked the latest development in his artistic output when he was asked to add something alongside a preexisting work from Vinie Graffiti in Spitalfields, and deciding to go with some balloon musical notes that Fanakapan found via Google a design for a chrome based balloon design which sparked a change from the translucent to the opaque, reveling in the reflections and shadows such subjects offered, allowing him to focus in the folds and drop shadows. 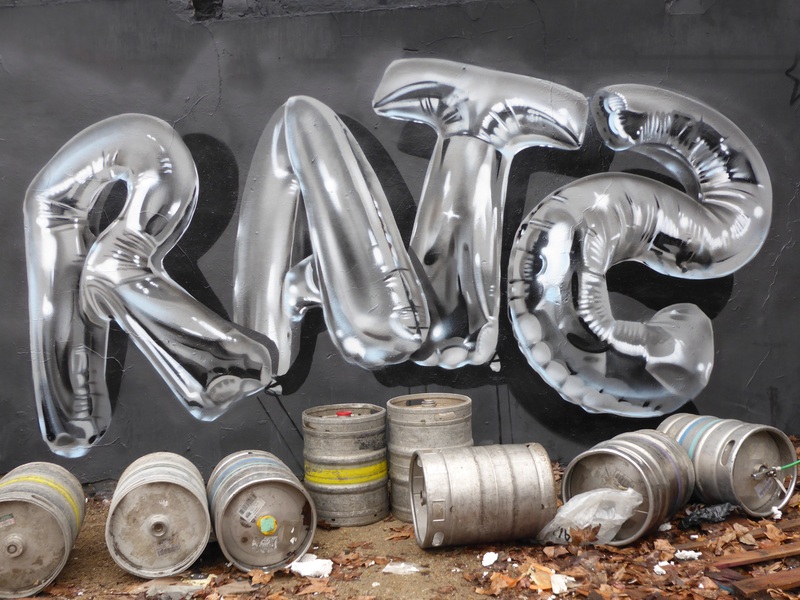 It was a few months later in Berlin that Fanakapan painted his first full on chrome based design, something which he has been pursuing in a variety of approaches since, continuously striving and succeeding to improve and enhance his style and effect, demonstrating his superb use of shadow and reflective light highlights to make his works just pop of the surfaces they adorn in a full 3D effect. Fanakapan’s current show marks a culmination of a style Fanakapan has been persistently honing over the last 14-15 months, throwing in some interesting mediums to accompany the expected paintings, this exhibit through the presence of sculptures and a stained glass collaboration demonstrates another impressive dynamic to his artistic output on the streets. As with his output on the streets the pieces in the exhibition offer subtle hints to larger messages or reflect on acute elements of Fanakapan’s personality, something superbly reflected in this exhibition, exemplified in this exhibit with the excellent and witty ‘Nothingbutshitonthetelly’ piece. 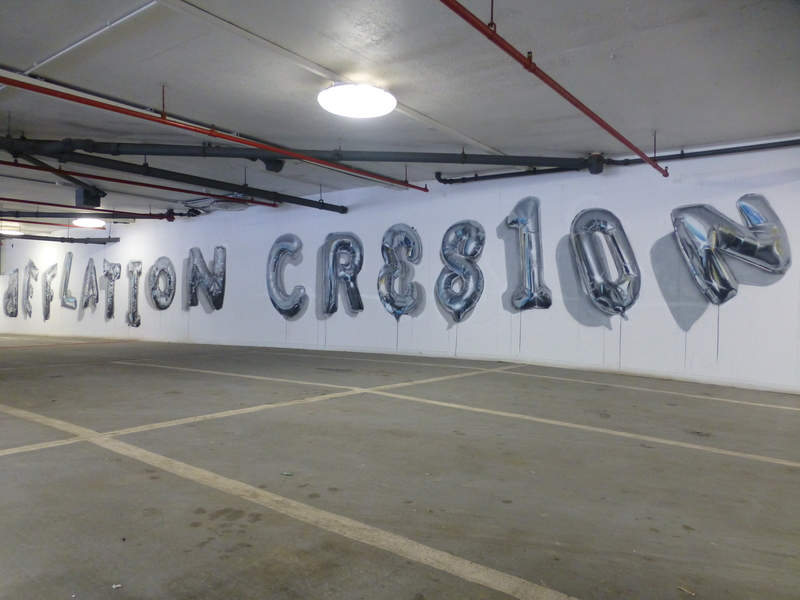 For the exhibition Fankapan set to keep to a same style working with a series of subjects based upon his hyper-realistic depictions of helium balloon compositions, whilst at the same time setting to convey a variety of ideas, ranging from personal to political and to humorous. The works in the exhibition presents some interesting new dynamics in his works, with a particular focus upon background elements, with pieces such as ‘High 5’ & ‘Taking The Mickey’ featuring forced perspectives in which to make the central figure standout. Works such as ‘Concrete Kiss’ which focus on a singular letter on a canvas provide the best opportunity with which to focus on extreme detail and elements such as the light blue highlights present a sense of forced light where as the artist puts it himself “Where Shadow Ends, Light Begins”, something which in a few short words perfectly encapsulates the very essence of Fanakapan’s art. Work in Star Yard, Brick Lane, with Horror Crew. Work in Star Yard, Brick Lane. Work in Camden Town, with Irony. Work in Turnpike Lane with Irony. 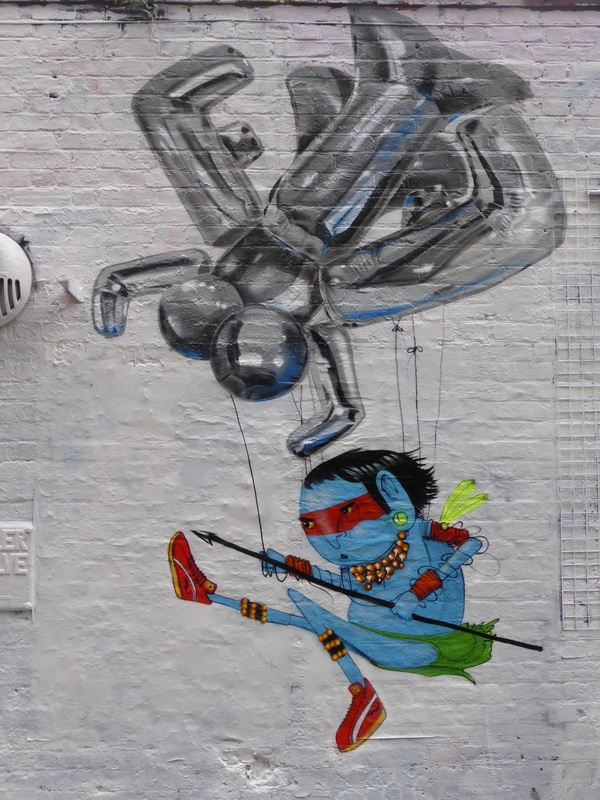 Work in Spitalfields alongside Vinie Grafiti. Work in Star Yard, Brick Lane. 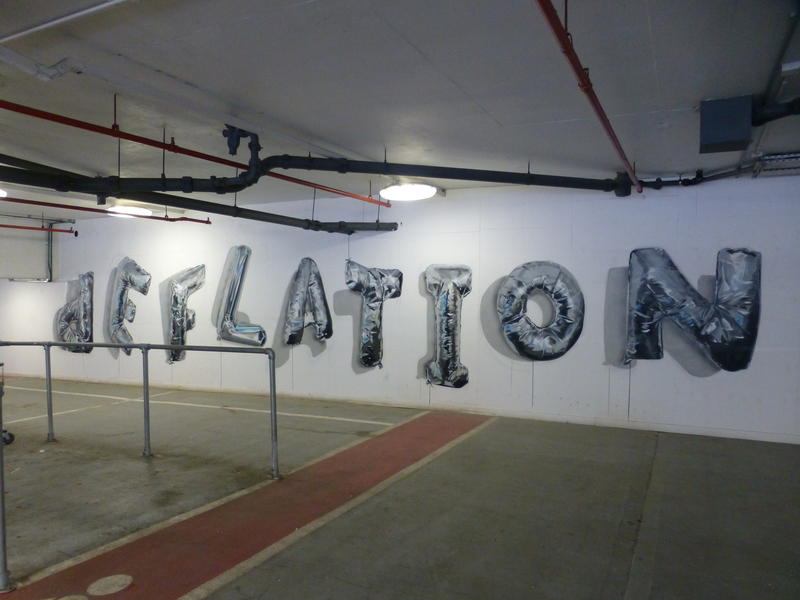 This work marked the first in London featuring Fanakapan’s full on shift to the monochrome opaque balloons as subjects. The inverted image to read ‘Rats’. 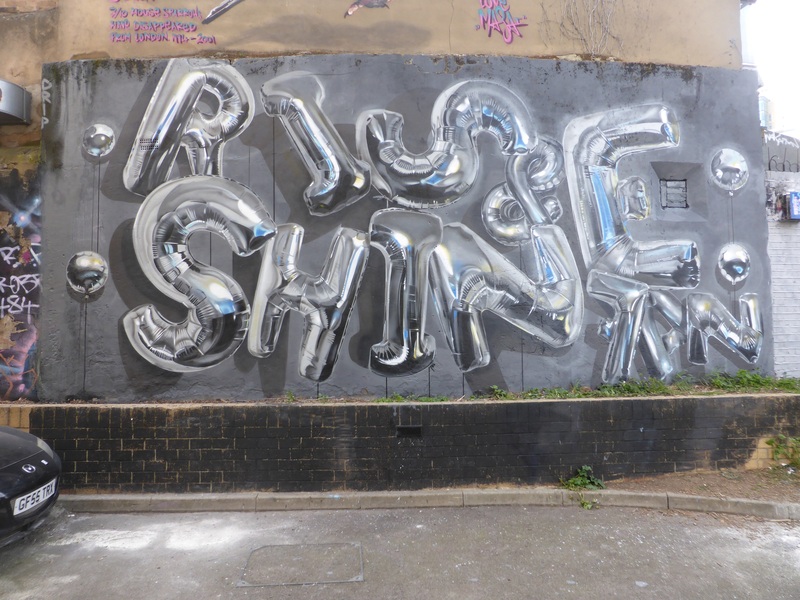 ‘Rise & Shine’ in Brick Lane. Work in Shoreditch with Cranio. 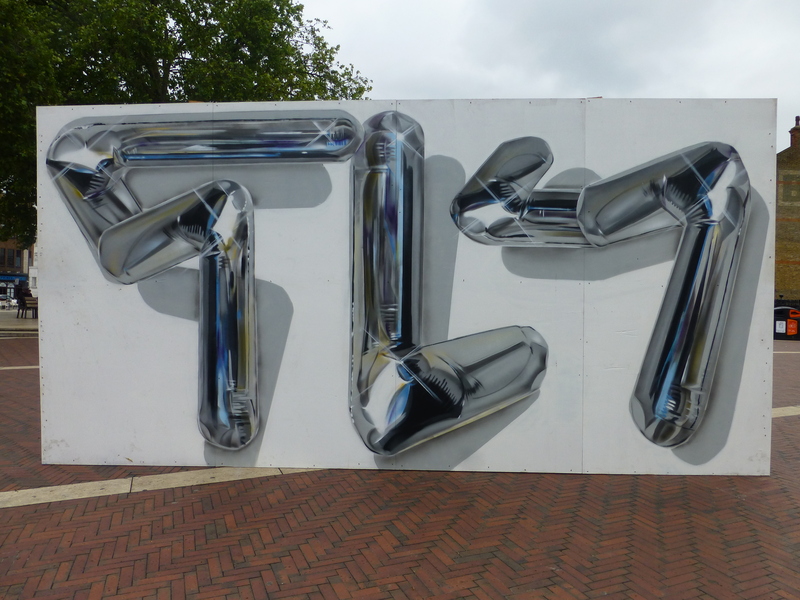 Work for Urban Art Brixton. Work in Bethnal Green with Bill Daggs. Self Portrait in Star Yard, Brick Lane. Workin Camden Town with Cheba. ‘Deflate’ in Dalston, comprised entirely of reorganised ‘7’s’. 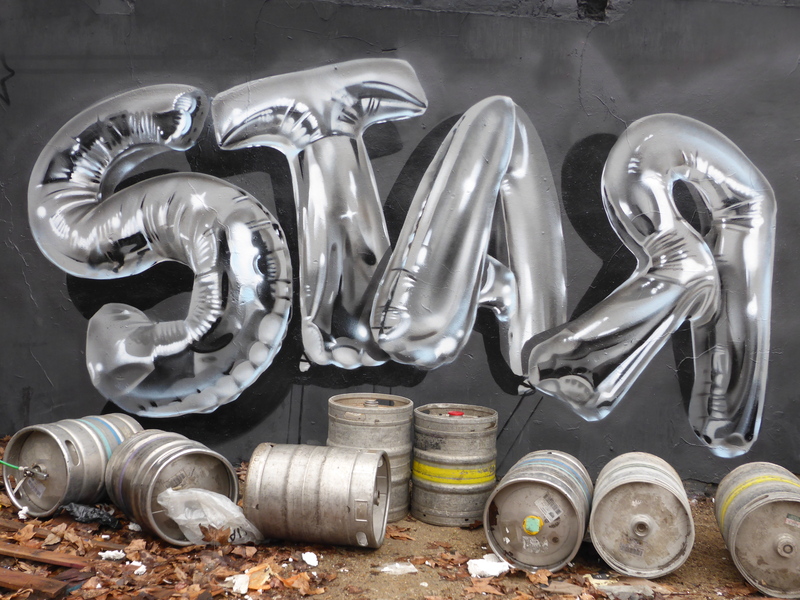 ‘★‘ – Spray Paint on Canvas. Fanakapan was interviewed on April 15th at the BSMT Space. Thank you for the kind words Inspiring City, glad you liked it. Ditto the above… An amazzzzzing artist indeed! I just wish he had a better name that is easier to pronounce..
Haha Mitch, see your point but on the other hand, it’s only apt that such a standout artist also has such a standout name, not one you forget in a hurry. 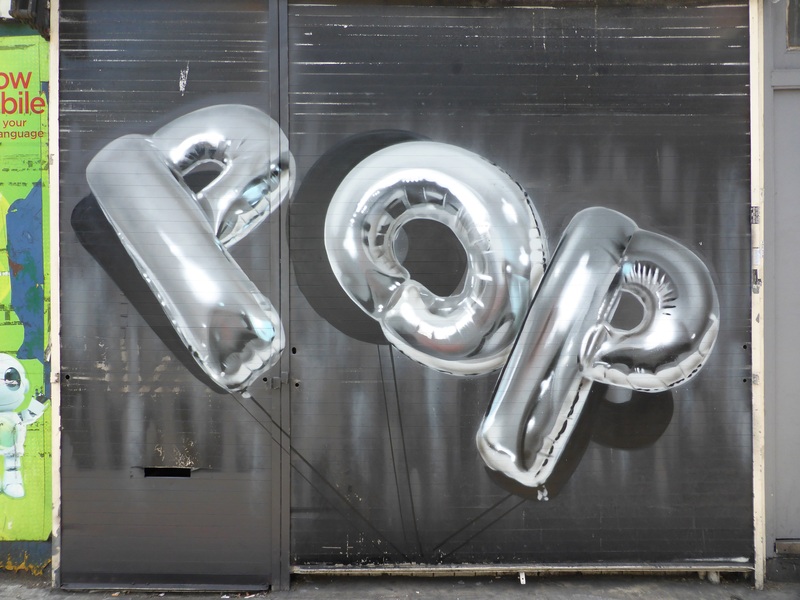 Brilliant interview – so interesting to see where the work has come from and how the small instances in life (such as having excess pink paint) can change an artistic direction! Thank you New Art Rioter, yeah it was those little anecdotes that really emphasize how Fanakapan can work something so good whatever the restrictions and in turn take those ideas further in subsequent pieces. What a great interview. I am a big fan of Fanakapan and it’s always a pleasure to see his work. I initially learned about this artist through your blog and have followed his work for a little over a year now. I was in the Wynwood district this past March and was desperately trying to locate works by Fanakapan, but after 2 hours of walking, had to stop due to the rain. Damn Florida. Great interview! Keep up the good work guys! Thank you Maria, a pleasure to see you here again. 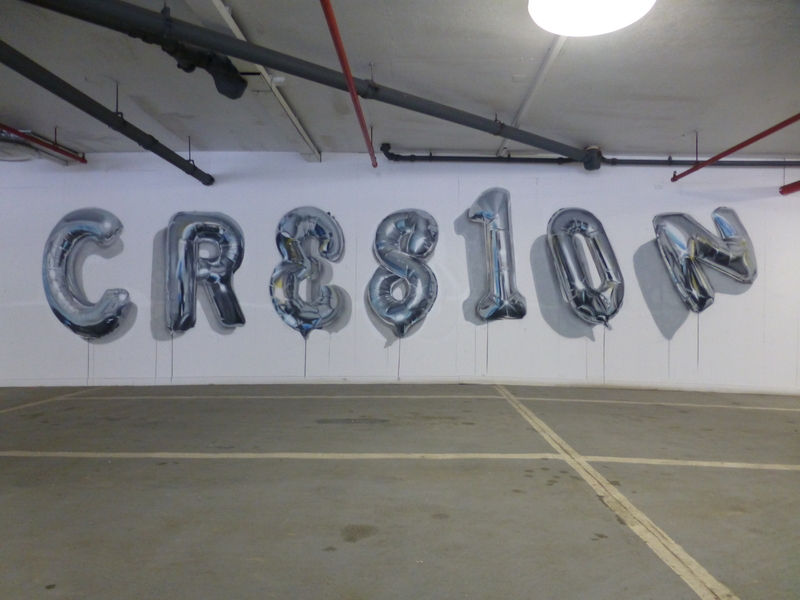 We are delighted to hear that you have been following this artists work from all the way across the pond having discovered his talent via our blog and we are also sorry to hear you didn’t get to see any of his work in Wynwood, but on the plus side you must of seen some incredible pieces, Wynwood seems to be the Holy Grail of Street Art at current.